Fair Claim Settlement: More often than not, your insurance company will offer you a lower settlement than the actual cost of replacement when it comes to property damage. This is more so the case on mid to large claims caused by a fire, hurricane, tornado, large hailstorm, etc. For most, large claims like these can turn into a nightmare. Even with a smaller roof damage claim – if you can’t get a new roof, or repair your damaged one, for the amount that your insurance company is offering, you will be out of pocket for the difference. You basically have two options – you could eat it and move on, or you can consider speaking with a public adjuster to see how they can assist you in obtaining a fair claim settlement. A Public Adjuster is licensed by the NC State Department of Insurance. All NC Public Adjusters with an active license are also insured and bonded. Your NC Public Adjuster is legally empowered to negotiate your claim damage with your insurance company on your behalf in an effort to obtain a fair claim settlement. Being that this service is regulated by the state, public adjusters cannot charge any upfront fees or retainers. Public Adjusters earnings are restricted to a percentage of your settlement. If you do the math, you will find out that this works out to be cheaper than hiring the services of a lawyer. In April 2014, a hailstorm hit the area where Robert Richardson lived. As with many hail situations, the damage only became apparent a year later, when the concrete roof started leaking. Richardson contacted his insurer immediately. Unfortunately, the insurance company advised there would be no coverage and his claim was denied. The adjuster stated that they wouldn’t pay because the roof was old and outlived its life expectancy. He got in touch with a public adjuster who assessed the damage. The adjuster took pictures of the roof as well as the damaged interior. The public adjuster then forwarded a detailed report including the photos and a weather report to the insurance company, along with a detailed estimate of the damages. The public adjuster also made it a point to follow it up diligently; and after a few months, Richardson was awarded $134,000 to cover the cost of a new roof plus damage to his interiors. Needless to say, Mr. Richardson was happy to have collected a fair claim settlement. Marisol Horta, a United States Marine, from Jacksonville, NC, is another person who benefited by using our Public Adjusting services. Marisol had a house fire and was overwhelmed with the process… So, she reached out to us. 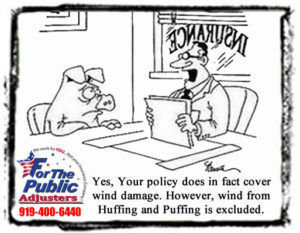 Make sure that the public adjuster you are considering has a valid license to practice in the state you live in. You can verify this by contacting your Department of Insurance or the Office of the Insurance Commissioner by phone or email. even if you do not actually hire a Public Adjuster, you should definitely consider speaking with one about your situation to be sure you obtain your Fair Claim Settlement.